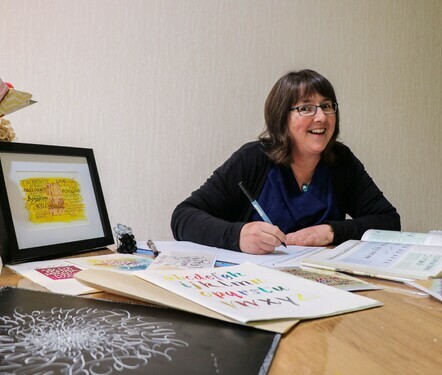 Marian lives in a rural setting close to Hamilton City, New Zealand where she runs her small calligraphy business from home. 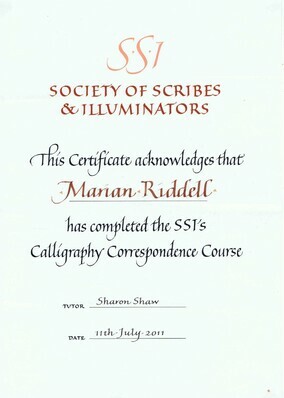 With over 20 years experience, she has completed a calligraphy course via the Society of Scribes & Illuminators UK (formerly run by the Roehampton University, London). 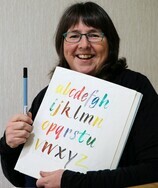 She has also attended a number of calligraphy workshops tutored by International Calligraphers both here in NZ and in Melbourne. Names on certificates, wedding stationery/signs, poems, matt boards, name plaques, family trees, presentations, menus, and one off calligraphy pieces. Enjoy checking out the website and feel free to contact Marian if you have any queries or questions. Certificates - name & date written in black waterproof ink onto pre-printed certificates. Send me certificates with details to be added, please remember to include extra blank certificates. Invitations can be designed at a one off cost. Artwork will be ready to take to a printer or print yourself. Guest names onto invites - $1.50 per line in black ink, $2.00 per line in gold or coloured ink. Envelopes Addressed - $4 per envelope in black waterproof ink, $6 per envelope in gold or coloured ink. First name e.g. "Marian" $1 per name in black. $1.50 per name in gold or coloured ink. First & surname e.g. "Marian Riddell" $2 per name in black or $3 in gold or coloured ink. 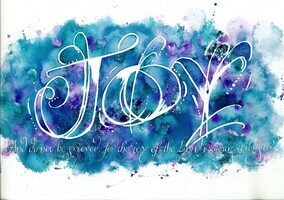 Calligraphy commission - please contact me for a quote. Please contact Marian for more information on pricing or to book an appointment. New Zealand clients only. A 50% deposit will be required before proceeding with final calligraphy piece. Workshops coming up in 2019. I would love to have you come along to one of these Saturday courses. Aimed at Beginners... to Intermediate level. To be held at Oaks Church, Gordonton - Garfield Street. BYO lunch or pick up from a local cafe. Message Sent. Marian will be in touch once payment has been received. Thanks so much for registering - it will be great to have you at the workshop. Note: Classes are limited to 12 students. Once payment received I will email you that you have registered for the workshop. 1. Private Lessons These are held on a Friday at a time suitable to both parties. Cost for a 2 hr lesson is $80 per person. Worksheets are provided and pens also if required. Come along with a friend for a great 2 hrs intro to Calligraphy. 2. Attend one of the workshops above.